Fuel – their only requirement is cool, well oxygenated water. Security - provided by a lie with access to deep water, and ideally additional protection provided by overhead vegetation. 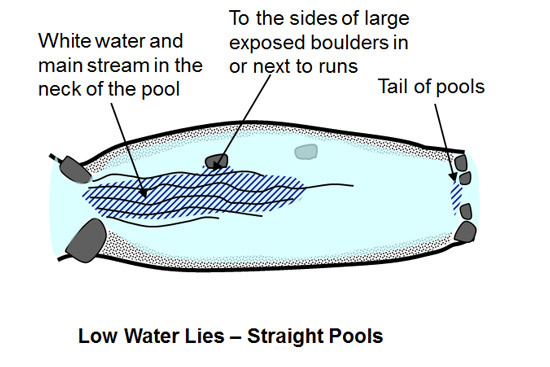 Comfort - provided by lies in pools, pots and runs where they can hold without expending too much energy, typically in smooth flowing water, next to or in front of submerged boulders and large rocks. In low water these conditions are best met in the fast flowing and deeper water at the heads (necks) of pools and in the main current immediately downstream. 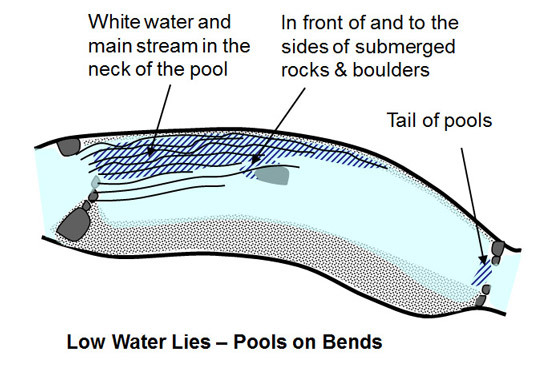 To a lesser extent, the tails of the pools may provide lies also as the river generally narrows, and sometimes shallows here, producing an increase in flow rate. In pools located on bends, the main flow will be next to the bank on the outside of the bend, and this can provide further security as the banks and bankside vegetation will offer additional protection and shade. As long as the basic requirements described above are met, preferred lies can also be found in deep holes (particularly below fast runs), in slots and holes in bedrock shelves where they form the river bed, and to the sides of gravel and shingle bars, adjacent to the current. Fishing in low water is generally associated with summer when the hours of daylight are long, and the sun is high overhead for much of the day. These conditions are far harder than when the river is high, as salmon are far less inclined to take, and are far more easily spooked. 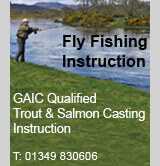 The basic considerations are to fish early or late when there is no direct sunlight on the water, and to fish with stealth - downscale your tackle and fish with lighter rods/lines, lighter leaders (8-10lbs b.s), & smaller flies (12s-14s in doubles, ½ to ¾" tubes and bottle tubes), and avoid wading. 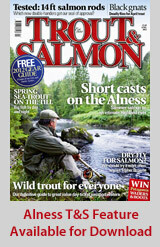 In mid-July on the Alness, sunrise is at around 04:40 a.m., and sunset is at around 10:00 p.m. By 09:00 a.m. when the majority start their fishing, the sun is already 30 degrees above the horizon, and it is 6:00 p.m. before it as low in the sky again. While this is less important when the water is high and/or skies are overcast, in low water and fine weather your chances of success are much better fishing at dawn & dusk.